first, get your sheet of foam core. spray one side lightly with spray mount. but any spray adhesive will do. and used cans to keep the ends from curling up. but you could use any pattern! and adhered the paper to the other side. and again, carefully smooth out any bubbles. and then laid them out on the foam core. good cut with foam core? blade for all of the straight cuts. so you could get a good visual. to use as a hanger because i couldn't find any wire! i used a contrasting paper for the mount. this entire project only cost me .99.
i love the fun pink paper mixed with the faux bois! Thank you, thank you, thank you. I love it. The first thing I did this morning was check to see if you posted yet. You are awesome! Oh I love it! I think my boys need some antlers in their room. Thanks! Oh -- Autumn, you are a genious! Great job and I love the whole look. Well done!!! WOW! I love this project!! 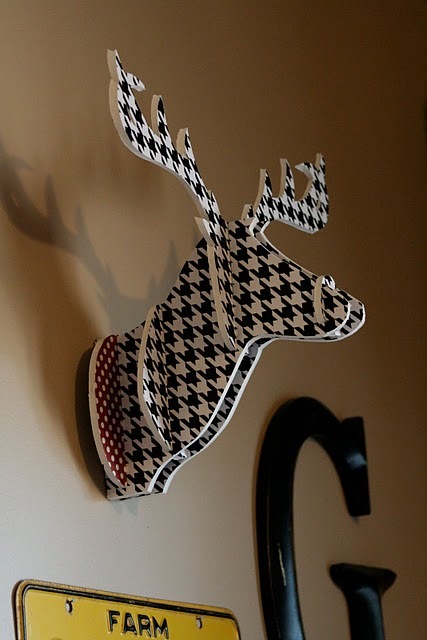 I love houndstooth! Great job! Can't wait to see the reveal! all of blogland needs to see this! i was planning on ordering a cardboard trophy next month for my son's room. not anymore! amazing! i'm tweeting about your little project! so cool, I really want to try this. Great choice in paper for this project! well this is unique and cool! OK, I ran to Michaels and bought my materials this afternoon to do this. Cutting through the foam core was more difficult than I thought. In fact, the inside of my foam looks like a mess...not smooth like yours. Any tips? SHARP XACTO BLADES...and lots of them! i actually went through three blades on this project! the curves are a little hard to cut, but are MUCH easier if you have a new blade! you could also use black foam core---it tends to show the "bad" cuts a little less. best of luck..i hope your next try turns out better. Perfection! You did an amazing job! Woo hoo! that is crazy good!! I am loving it!! These are great! Great tutorial too! You always share the most clever ideas! Love them! Oh that is great! I love it! Love the room and I might just give the project a try. I have that wrapping paper too. 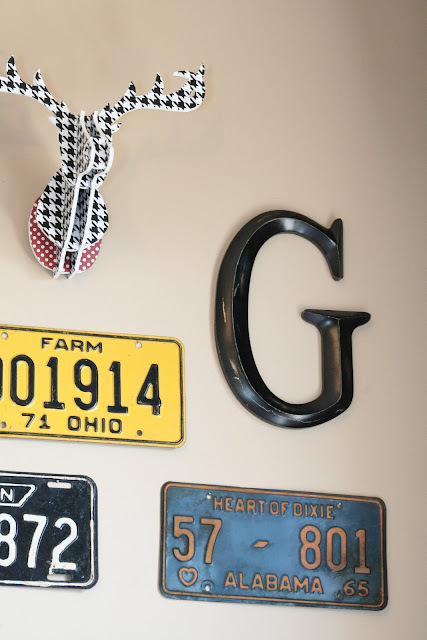 I love how versatile houndstooth is! I keep a roll on hand at all times! i LOVE this idea! How cool. We just bought a cabin and want a modern country feel to it and this is perfect. going to have to give it a try. This is fabulous! 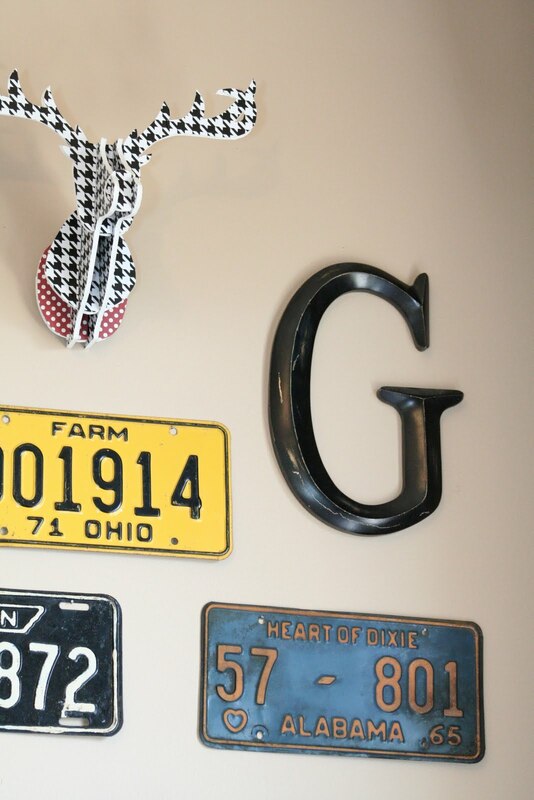 Love the houndstooth print - Gorgeous! Would love to have you stop by the Sunday Showcase Party. Hope you are enjoying your weekend! Thanks so much for the great tutorial! I am in love! Houndstooth makes me happy! This is so cool! 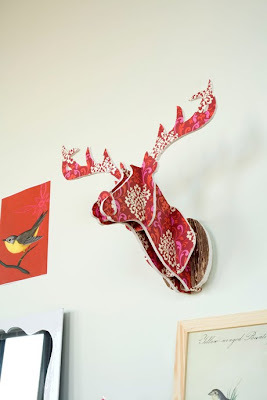 I should make one for our family room so my husband doesn't think he needs to go deer hunting anymore. We have one real deer head in the room and although it's beautiful it always makes me feel a little sad. And I have to go back to make sure I didn't iss it, but where did you find the fabulous paper? You've used it before and I LOVE it! Thank you very much. Your version is so much easier and clear. Do you think I could cut it out of thick carton box and spray paint? yes, i think FOR SURE these can be made from cardboard! great idea! and cheap too. the best way to find faux bois paper is to go to a local scrapbook store, or look at a online scrapbook paper store. good luck!